To sum up the man and the artist would take more than the millions of words we have exchanged over nearly twenty-five years of friendship… but here goes. Firstly there is the technical prowess in oil, tempera, watercolour and graphite – a benchmark for all of us working in a representational style. His work is all about the perception and analysis of reality, and the ability to then translate that experience into the exquisite language of paint. This he is as passionate about today as the moment decades ago when he first picked up a brush, and many the student over the years has gravitated towards him for that core knowledge, experience and professional nous. Then there are the years of teaching at NCAD, an enormous contribution to that institution. Why? Because he could talk about the language of painting when it wasn’t popular or fashionable. He shepherded those faltering students more driven by content or ambition but lacking a way of doing, or understanding how to do, and any of us who wanted to learn. Overriding, complimenting or directing and using a timeless language, relevant to any painter, of any time, he taught students to understand design, tone, pictorial harmonies, composition, structure, planes, figure to ground, taste and refinements of aesthetics in the execution of a style. Those words taste and refinement are not anachronisms, but, when really understood, separate routine work from really exceptional drawing and painting. Then there is Carey Clarke, a stalwart of the RHA (President from 1992 to 1996), demonstrating by example the best of its core values. Academic is not a dirty word, but has been misunderstood or given a negative spin – along with decorative or illustrative – in the lexicon of some critics and pundits. Those who know the true meaning of the word know its application to art. Carey is still an active member of the Academy, is part of its vital core, institutional memory of the place, and still has a voice. We value that voice and the gentle reminders of history and protocol, regulations and anecdotes. So Carey in all of this has produced a remarkable body of work that is of the best of the European classical tradition, in portraiture, still life, landscape and interiors, and Irish in his commitment to the landscape of his native place – making him the continuum, of Osborne, Orpen and Keating, Hennessy and McGonigal, but by association Sargent, Ingres and Poussin, and right back to Giotto and the formal beginnings of a realistic language of representation. Full article, Carey Clarke – A Tribute by James Hanley RHA published in exhibition catalogue. 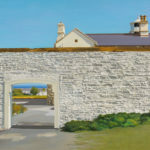 Carey Clarke PPRHA, The Way In, 2005/8, Oil on canvas, 77 x 102 cm, Image courtesy of the artist. Carey Clarke PPRHA, Early Morning, Piazzeta San Marco, 2008, Oil on canvas, 71 x 91.5 cm, Private collection. Carey Clarke PPRHA, Portrait of Hannah Bloom Teskey, 2010, Oil on canvas, 71 x 56 cm, Private collection. Carey Clarke PPRHA, Furnace, Dead Sea, 1999, Watercolour on paper, 51 x 68 cm, Private collection. Carey Clarke PPRHA, Substance & Shadow, Brass Kettle, 1980, Tempera on gesso panel, 69 x 86 cm, Private collection. Carey Clarke PPRHA, Evening Light, 2006, Oil on canvas, 97 x 97 cm, Private collection. Born in Co. Donegal in 1936. Clarke studied at the National College of Art and Design, NCAD, Dublin (1954 – 1959). Following graduation Clarke took a part-time teaching post at NCAD in 1959, was elected Associate Member of the RHA in 1967 and was appointed full time teacher of drawing and painting in NCAD in 1968. He then continued to both study (1969, studied painting under Emilio Vedova, at the Salzburg Summer School of Fine Art, Austria and 1976 – 77, sabbatical year spent painting and studying in Italy with special research into methods of tempera painting under the guidance of Pietro Annigoni in Florence) and lecture at NCAD. Clarke was elected Member of the RHA in 1981 and was promoted to Senior Lecturer in Department of Painting, Faculity of Fine Art, NCAD in 1985. He then served as President of the RHA from 1992 – 1996 and was elected Honorary Member of the Royal Academy, London in 1993 and elected Honorary Member of the Royal Scottish Academy, Edinburgh in 1993. Clarke retired from teaching in NCAD in 1995 and continues to paint on a full time basis. Solo exhibitions include Molesworth Gallery, Dublin 1966, Winged Arts Gallery, Sedona, Arizona, USA 1972, Emmet Gallery, Dublin, 1973, Grafton Gallery, Dublin, 1987 and the Solomon Gallery, Dublin in 1990. Major group exhibitions include Irish Exhibition of Living Art, Dublin, 1956, Oireachtas Art Exhibition, annually 1957 – 1978, RHA Annual Exhibition 1967 to date, Christopher Gallery, Madison Avenue, New York, USA, 1973, Faculty of Fine Art, NCAD Staff/Student Exhibition, Project Arts Centre, 1979 and at the Douglas Hyde Gallery, Trinity College, Dublin in 1979, Royal Academy Summer Exhibition, London, 1993 and annually to date, 2nd Biennale Internazionale Dell’Arte, Florence, 1999, SIAR 50, Fifty Years of Irish Art from the collections of the Contemporary Irish Art Society, IMMA, Dublin in 2005, BP Portrait Awards Exhibition, National Portrait Gallery, London, 2009, Davy Portrait Award Exhibition, Naughton Gallery Queen’s University Belfast, 2010, Life Room, Bourne Vincent Foundation Gallery, University of Limerick, 2011. Clarke has received many awards over his career, including Prize for Portrait Painting, National Art Competition, Royal Dublin Society in 1958, E.S.B Keating/McLaughlin Bursary for Art and Silver Medal, RHA Annual Exhibition, 1985 and 2000, Open Award, Arnott’s National Portrait Competition, Dublin in 1986, M. Kennedy & Sons Portrait Award, RHA Annual Exhibition in 1997, Citta di Firenze Bronze Medal for Career, 2nd Biennale Internazionale Dell’Arte, Florence, 1999 and the Ireland-U.S Council Portrait Prize, RHA Annual Exhibition in 2008. Clarke’s work can be found in the collections of the Ulster Museum, Belfast, Haverty Trust, Dublin National Self-Portrait Collection of Ireland, University of Limerick, Allied Irish Bank, Bank of Ireland, Smurfit Collection and private collections in Ireland, U.K. and U.S.A.
A full colour catalogue, with essays by Gerard Walker, Bruce Arnold and James Hanley RHA, will accompany this exhibition.